After 5 terrific days in Paris, it was time for us to say goodbye. Our next stop would be 3 nights in Belgium, using Brussels as our home base. To get from Paris to Brussels, we took the train which was quick and efficient. By mid day, we arrived in a cold and gray Brussels. It was our plan to just spend this half day exploring Belgium’s capital city before we moved on to other destinations we planned to visit. Built in to my schedule of our blitz through Brussels included a stop at several famous chocolate shops, both of which were featured in the list of top 10 chocolate shops in the world worth visiting that my husband had sent to me months before our trip. 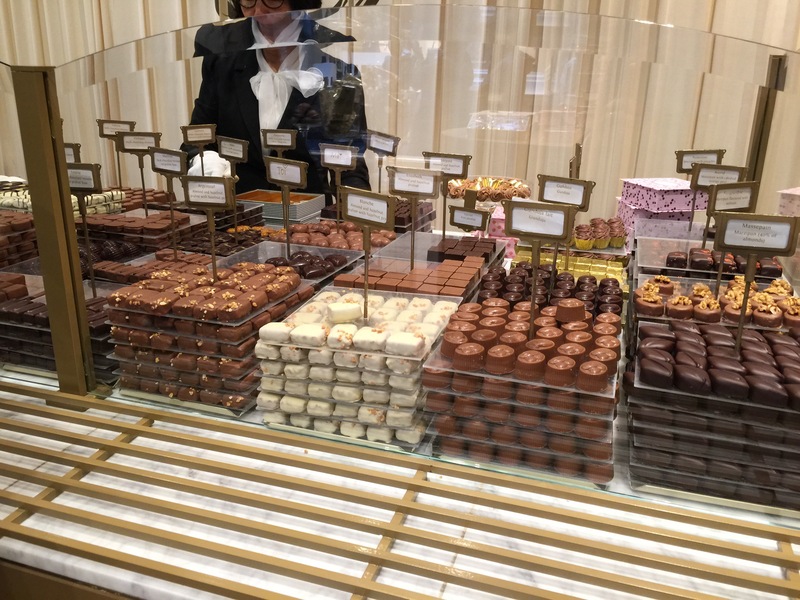 The first chocolate shop we stopped at was Mary, in the gorgeous Rue du Faubourg Saint-Honore shopping center. 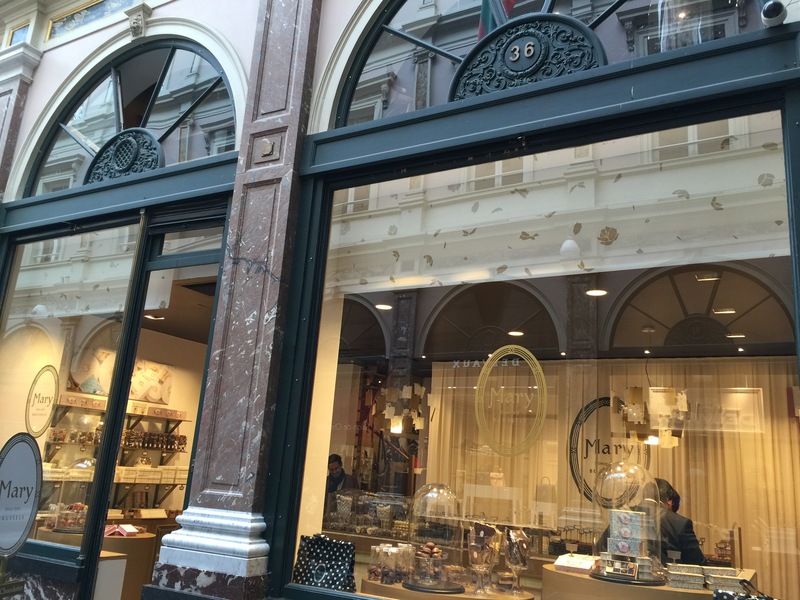 The creation and passion of Mary Delluc, she strived to spread the word about her amazing chocolate creations by setting up her first shop in the heart of Brussels. Mary established her first shop on Rue Royale which was on the main highway connecting the King’s Palace in Laeken to the one in Brussels. This spot was ideal as it was also a well known area where many of the city’s nobles and bourgeois people would stroll on a daily basis. Soon, word about Mary’s chocolates, and tea room (which she subsequently opened) spread and more and more people came to Mary’s shop. As guests came in, she created a guest book where she would take note of what types and kinds of chocolates people in enjoyed and she started catering her chocolate creations towards the tastes of her clients. For Mary, not only was the chocolate itself an art form, but she believed that the beauty of her store should match the quality of her goods, so each store is decorated in a beautiful art deco, classic elegance. Eventually, Mary was given the title of the “Purveyor to the Royal House of Belgium,” a title that has since been renewed twice: in 1990 by His Majesty King Baudouin I, and again in 1994 by His Majesty King Albert II. When my husband and I first walked into the shop, the first thing we noticed was how immaculate and beautifully designed the store was. 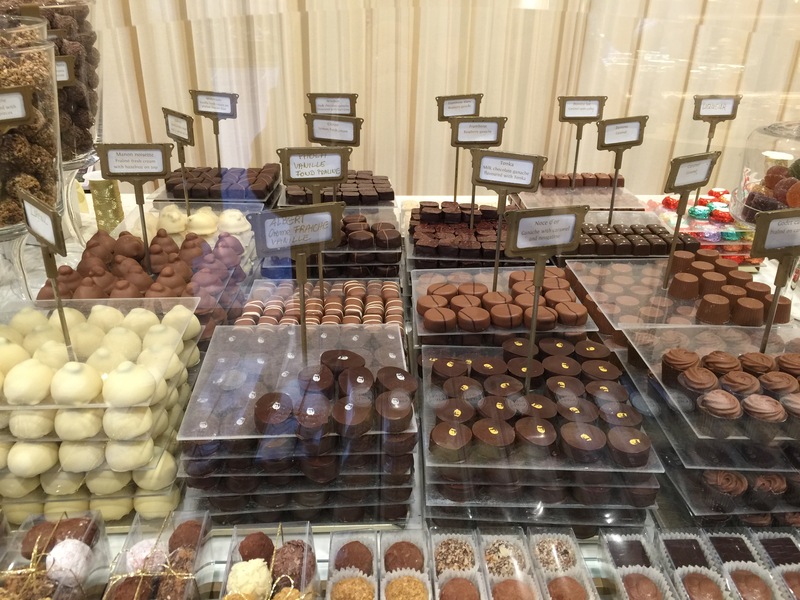 Pre-packaged boxes discreetly lined store shelves, but the main centerpiece was a whole display of various and sundry fresh chocolate bon bons and truffles spread out behind glass. Each chocolate bar, oyster, truffle and shell looked more delicious than the next and we knew that we were in trouble. 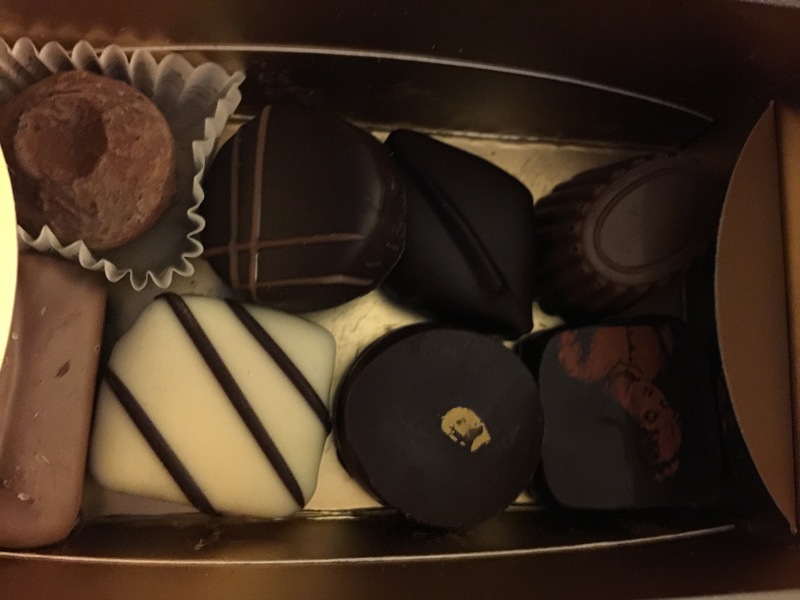 We decided to purchase a couple of pre-packaged boxes to bring home to the States as gifts, but we also decided to have the white-gloved ladies behind the counter put together a box for us of chocolates that we could pick ourselves. This box we were having made would be a box of chocolates we could enjoy while we were in Brussels. There were so many different types of chocolates we didn’t even know where to begin. The small box we selected, sold by the weight, could hold approximately 16 pieces of chocolate. So, now it was a matter of choosing 16 different pieces of amazing looking chocolate. Luckily, everything was labeled and in English, not that that made choosing any easier! Each chocolate piece at Mary is individually hand-made and hand-decorated, and they are all different. The chocolates run the gamut from milk chocolate, to white chocolate to dark chocolate with all sorts of pralines and fruit filings that you just couldn’t believe. There is the Albert crème fraiche vanilla, presumably named after His Majesty King Albert. There was the fruit flavored Framboise filled with raspberry ganache and enrobed in milk chocolate. Or there was the Framboise Blanc, the same raspberry ganache bon bon but enrobed in white chocolate. There was the circular disc called the Noce d’or which was chocolate filled with ganache with caramel and nougatine. Or the Domino Lait, the caramel filled with coffee. That one was right up my alley. It’s much harder than you would imagine to choose 16 individual pieces of chocolate when you love chocolate as much as I do. I literally could have eaten one of every single piece of chocolate in the store. And the way it was presented and packaged just made it that much more elegant. 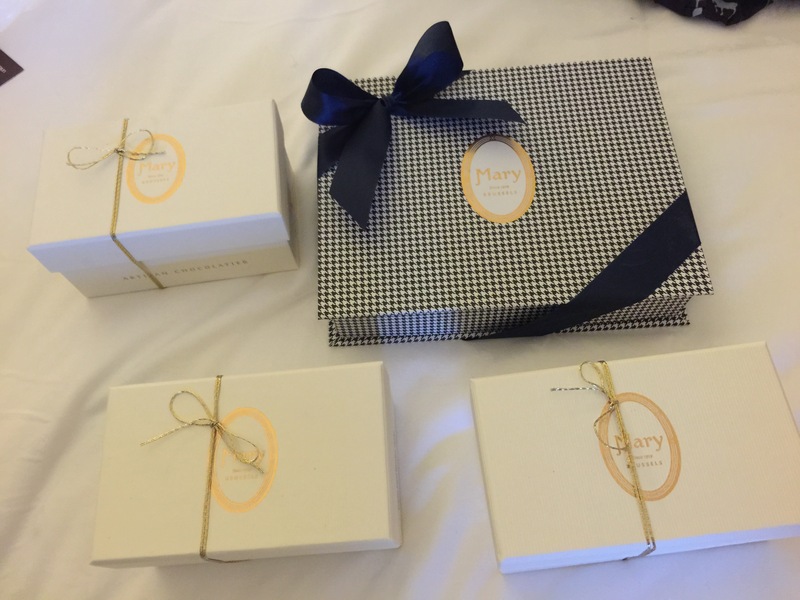 It’s this personal touch and quality that sets Mary apart from other chocolatiers. There’s the beautiful Manon Noisette which is a praline with fresh cream and a hazelnut on top. How about the Millennium chocolate with vanilla fresh cream with a praline biscuit base? That sounds delicious. One my husband would love is the Citron with lemon fresh cream. There was the very regal Windsor with dark chocolate ganache flavored with Earl Grey. The very beautiful Domino, which was just caramel, but shaped just like a domino piece. Mary even had liqueur-filled chocolates that were a big hit. There was the Baudouin named in honor of His Majesty King Baudouin made with milk chocolate mousse. The Louise made with dark chocolate mousse on a praline base. How about the Escargot filled with dark chocolate mousse but designed to look like a chocolate snail. And then there were the truffles that looked absolutely mouth-watering. Truffles filling large circular hurricane glasses caught my eye right away. 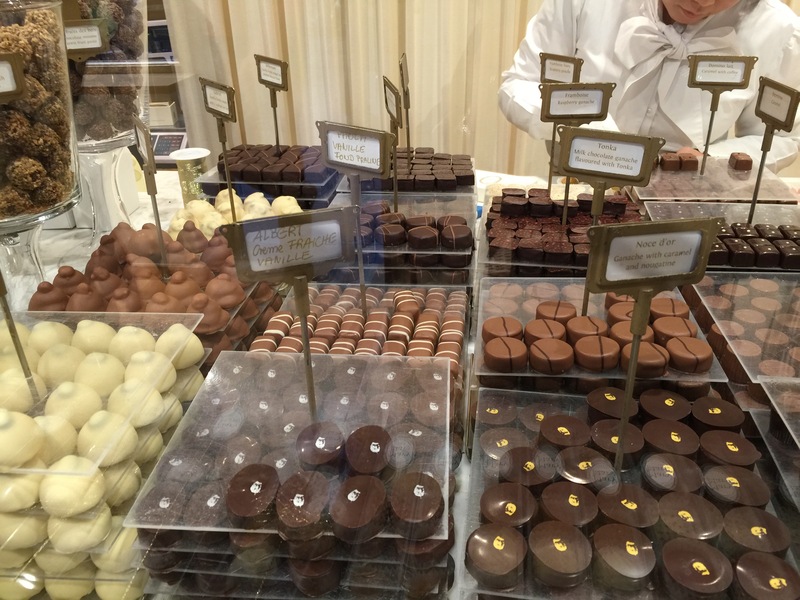 Not only the method of display of the truffles, but the different varieties of truffles being offered was fantastic. Flavors included truffles such as the Truffettee made with dark chocolate mousse, the Amandine which was praline dusted, Champagne Rose made with champagne and rose water, Noisettine which was praline dusted with praline pieces, Feuilletine with dark chocolate mousse and biscuits, the Truffle Champagne with dark chocolate mousse and Champagne Marc, or the Truffle amere with dark chocolate mouse and coffee, and finally the Truffle tiramisu with white chocolate mouse with tiramisu taste. After you make your selection, everything is boxed up so beautifully in a small box with two layers of chocolate bon bons inside. We couldn’t wait to get back to the hotel and start digging into it. Some of the chocolate pieces we had selected included the Noisettine and Truffle tiramisu, the Albert and the Noce d’or, the Framboise Blanc, the Godet Caramel with praline on a caramel base, the Amadeo with dark chocolate mousse (68% bitterness) and the Manon Noisette. I can’t even name any of the others we selected. All I can say is that my husband and I absolutely fell in love with the chocolate we bought at Mary. The quality of the chocolate itself was incredible, and you could taste how amazing it was with the first bite and every subsequent bite. Each chocolate piece was to be savored and enjoyed. 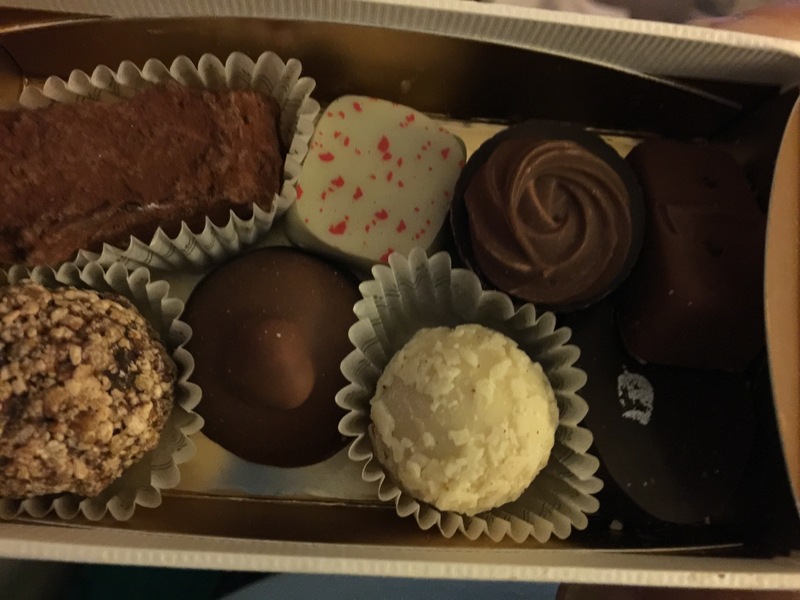 The chocolates that we brought home for co-workers and family were also a huge hit. When I brought my co-workers a box of Mary as well as some other chocolate from elsewhere, the Mary was definitely the most popular chocolate and my co-workers also indicated that after having tasted the Mary chocolate, the quality of the chocolate that Mary uses is far superior to any of the other chocolate I brought home for them. And the Mary chocolates were the first to disappear as well. 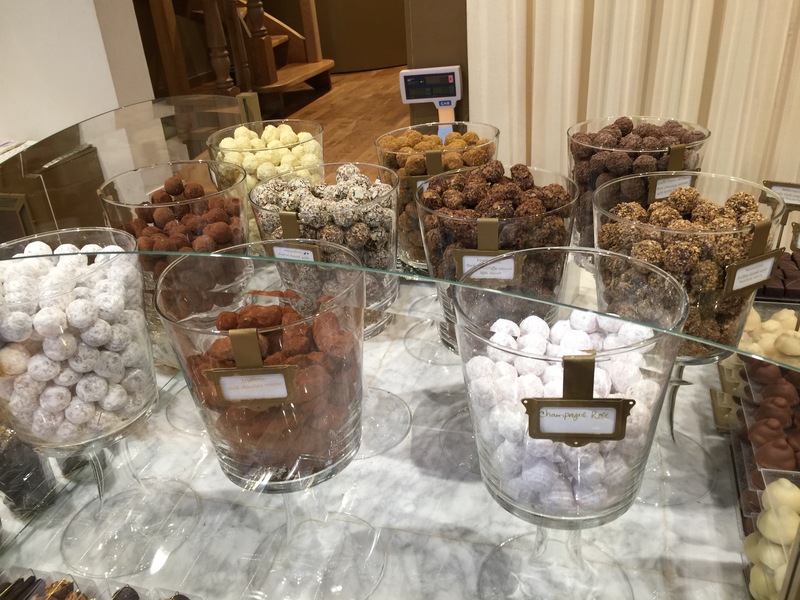 It’s easy to see why Mary is the “Purveyor to the Royal House of Belgium,” as everything about the chocolate shop is first-rate – the store, the design, the quality of the chocolates, the packaging and the service. For my husband and I, after our tour de force of all the best chocolate that Europe had to offer us, we felt that Pierre Herme and Mary stood out far above any of the other chocolatiers we visited. The quality and taste of the chocolate was far superior and more delicious than any of the other stores. 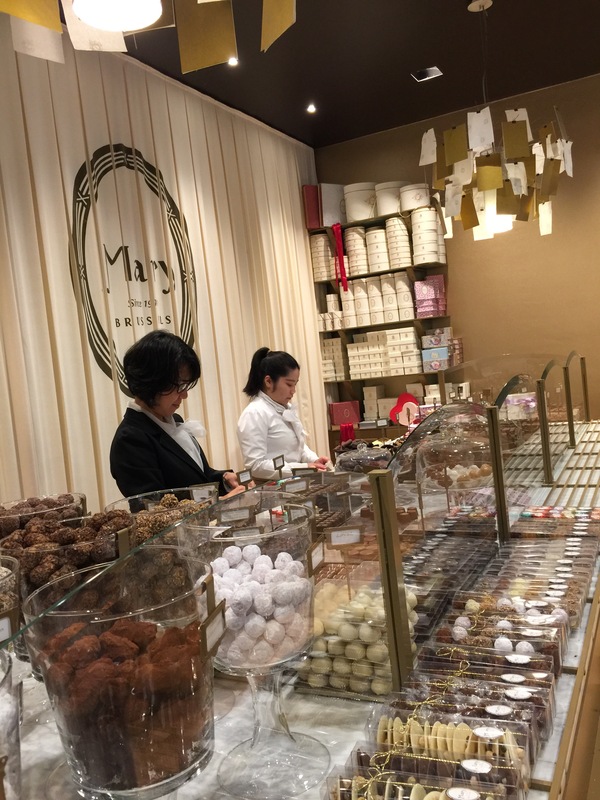 At Mary, they offer such a wide array of different types and flavors of chocolate, and all of them are delicious, that everyone is bound to find something to satisfy their taste buds. I would definitely go out of my way to visit Mary again in the future the next time I find myself in Brussels, its well worth the time and the effort.